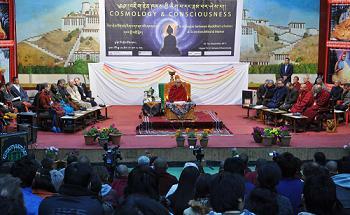 DHARAMSHALA, India -- His Holiness the Dalai Lama today inaugurated a three-day international conference on ‘Cosmology and Consciousness’, which brought together Tibetan Buddhist scholars and top scientists to explore ways to promote the integration of spiritual values and scientific investigations. The conference is an initiative of the Science for Monks Program under the Library of Tibetan Works and Archives (LTWA), which has taught science to Tibetan monks since 2001 under the inspiration of His Holiness the Dalai Lama. The Sager Science Leadership Institute, Emory University, and John Templeton Foundation are part of this initiative. This conference opens up the dialogue to the Tibetan monastic community in an unprecedented way. In addition to the panelists, eighteen Tibetan scholars from thirteen monasteries and nunneries will be engaged in the dialogue with scientists for the first time. “It is not only the vision of His Holiness the Dalai Lama, but the need of the time for Tibetans, and particularly Tibetan Buddhist monastics, to become conversant with modern science,” said Geshe Lhakdor, the director of LTWA. “Monastics studying modern science is a historic step in the history of monastic education and Tibetan Buddhism. Through becoming well-versed in traditional philosophical studies and modern science, it is our hope that monks and nuns can make a significant contribution to the betterment of the physical and mental health of people everywhere,” he said. In his address, His Holiness the Dalai Lama clarified that science and Buddhism do not contradict each other, as both are underpinned by a common principle of in-depth inquiry and analysis. His Holiness spoke on how science and Buddhism can work together to bring about inner peace and happiness in the world. “Wisdom alone is not sufficient to bring about mental peace, it should be generated by studying and training the mind,” he said. “The Tibetan Buddhism, a quintessential part of the Nalanda tradition, is the most profound and comprehensive tradition to study the mind. It can make a remarkable contribution to the scientists. It is the precious gem of the whole world,” His Holiness said. Emphasising the need to expand the propagation of Buddhist science and interaction with modern science, His Holiness called for greater efforts to generate more proficient science teachers and reference materials within the Tibetan community. During the course of the conference, the participants will discuss a range of subjects such as the nature of mind and consciousness, life and consciousness in the universe, limits of knowledge and knowing, mind, awareness, and behaviour, and serving humanity. They will discuss how best to advance investigations at the intersection of science and spirituality. Consonant with Holiness the Dalai Lama’s vision, the Library of Tibetan Works and Archives has made a historic stride in introducing science education to the Tibetan Buddhist monastic learning centers in the last one decade. Since 2001, it has established Science for Monks programme and Monastic Graduates Project through innovative partnerships with the Sager Science Leadership Institute, the Emory University, Exploratorium, and John Templeton Foundation. Over the years, Western scientists have taught more than 220 monks and nuns about physics, quantum mechanics, cosmology, biology, neuroscience, and mathematics, all with a strong emphasis on scientific inquiry. “Teaching the monastic graduates science, empowers them to better articulate points of relevance between and across traditions. Further, we have found that experiences rich in inquiry efficiently break down misconceptions, best represent the spirit of scientific process and provide a rich context for dialogue,” Geshe Lhakdor said.